Happy Monday, everyone! I hope you all had a great weekend. It was kind of ugly in Miami this weekend, which was a bummer because the mornings started out pretty! I picked up this pullover on Friday and got it in gray too. I didn’t think I would be so obsessed but… I am. 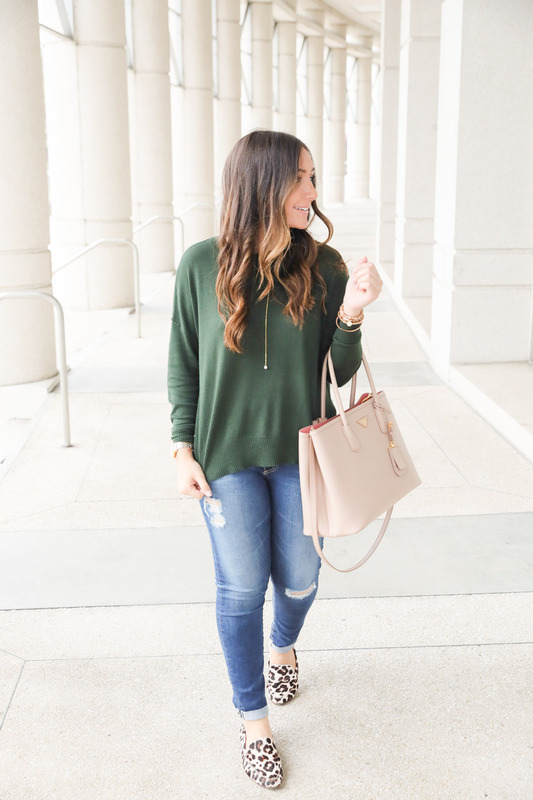 It’s the perfect pullover for fall and is SO soft. I’ve never felt anything so soft. It runs really big, though, so size down! I’m wearing a size XXS and I’m usually a small in tops. It’s also under $40, which makes it the most perfect pullover for fall that you can dress up, dress down, layer, wear on its own and more. By the way, make sure to check out all of taudrey’s new arrivals for fall. 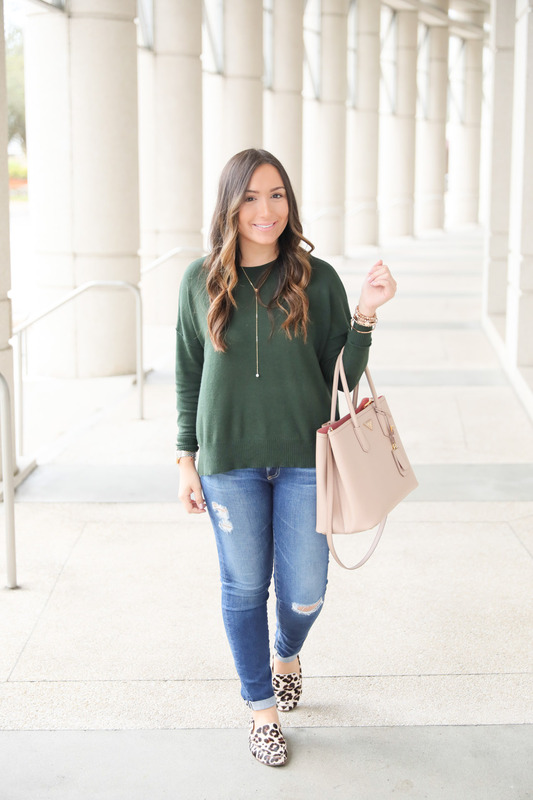 This long necklace is perfect for layering and I’ve been wearing it nonstop. It’s the extra long version! I hope everyone has a great day… thanks so much for stopping by. I hope that ugly weather leaves Miami! I am headed there tomorrow 🙂 Loving how you styled this pullover with the leopard flats! Always looking gorg girl! Love the green color. I am on the hunt for a green, fall green, sweater. You look great. Taudrey makes some of my favorite jewelry! Love this green and leopard print combo. So comfy! This pull over is so cute. Love you in green! Bummer that Miami wasn’t the best…but you look so cute! Crushing on that bag BIG TIME! Perfect sweater, gf! And I love that pop of leopard! What a great fall shade! Those leopard flats are too cute- love this look! Such a chic look! Loving that pullover paired with leopard. And your purse is always the perfect touch of elegance!